Under its new rallying cry of CRAVE MORE™, the President’s Choice® brand is encouraging Canadians to discover and savour global cuisine this holiday season. A recent survey found that two out of three Canadians enjoy dishes that feature a fusion of flavours from different cuisines*. 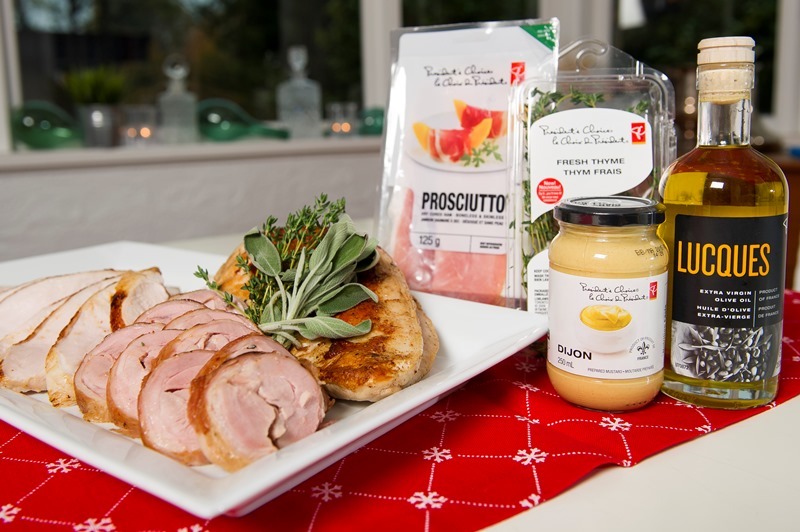 To help bring international flavours to Canadian kitchens, the President’s Choice® brand engaged top chefs and foodies from across the country to create globally-inspired twists on one of the most traditional holiday foods, the turkey. The chefs were given complete creative liberty when creating their recipes; their only instruction was to use PC® Free From® Whole Turkey as a base. With this mandate, each chef created exotic dishes that allow consumers to experience global cuisine over the holidays without leaving their home. For the holidays, BC-based Chef Dino Renaerts has teamed up with President’s Choice to create foodie-inspired turkey recipes that play to Vancouver’s strong culinary culture. 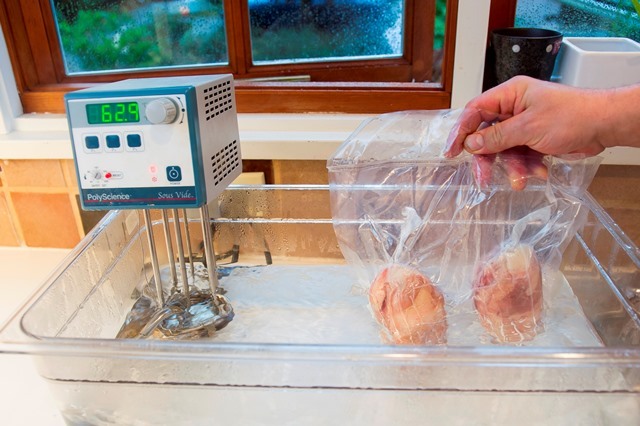 Why not consider a Turkey Sous-Vide for the holidays: easier than one may think, a sous-vide turkey has the advantage of staying moist, but most importantly, it can be prepared a week in advance, helping ensure less time in the kitchen and more time with friends and family. (A bake-alternative method is also included in the recipe). As for the day-after, turkey leftovers can be enjoyed with a tasty Turkey Stuffed Yorkshire Pudding served with roasted mini sweet potatoes. 1. Mix PC® Dijon mustard, white wine and PC® black label Lucques olive oil together in a bowl. Add julienned onion, garlic and mix together. Season generously with sea salt and cracked pepper and set aside. 2. Debone the turkey leg: split the leg to separate the drumstick from the thigh. Bone-out thighs and set meat aside in refrigerator. Drumstick and bones can be reserved to roast to make stock and soup separately. 3. Trim remaining PC® Free From Air-Chilled Whole Turkey to make a turkey crown: chop the back bone so as to leave the carcass rounded with breasts still attached. 4. In a deep dish or a large re-sealable freezer bag, add dijon marinade, de-boned turkey thigh meat and turkey crown. Refrigerate and marinate overnight. 5. When ready, remove from refrigerator, discard marinade and pat dry. 6. Assembly of turkey thigh roulade: in a pan on medium heat, melt 3 tbsp. of butter, and sauté diced shallots until translucent and just starting to brown. Set these aside to cool. Lay two slices of PC® Free From Prosciutto on a clean work surface. Lay turkey thigh meat in a single layer on top, season generously with salt and pepper, and add a sprinkling of chopped PC® Thyme and PC® Sage. Roll thigh meat into a tight roll – prosciutto should be on outside of roll. Tie with butchers twine and place in vacuum seal bag. 1. You will need an immersion circulator and vacuum sealer. 2. Vacuum seal turkey thigh roulades. Cut the turkey breast from the marinated turkey crown to remove from bone and place in vacuum pack, seal. 3. Prepare circulator with water, and preheat circulator to 150 F. Place vacuum sealed turkey (thighs and breast) into the water bath. Cook breasts for 2 hours and thighs for 2.5 hours. 4. Carefully remove vacuum packs and place into an ice bath (a bowl filled with cold water and ice cubes). Do not open the vacuum packs: once chilled, turkey can be kept in refrigerator for up to a week. 5. When ready to serve, remove breasts and thighs from vacuum bags, pat dry with paper towels and season with salt and pepper. Pre-heat oven to 350 F.
6. Heat a skillet on medium-high heat and add the turkey pieces, searing skin side down, until skin is crispy and golden. Remove from skillet and place on a baking sheet with a drip rack. Place in oven and bake for 15 minutes, until warm all the way through. 7. Carve and serve with PC® Cranberry with Port Wine Holiday Sauce, and home-made gravy. 2. Place turkey crown into roasting rack with a drip tray. Rub room-temperature butter over turkey skin and season with salt and pepper. Place the prosciutto wrapped thighs on drip tray also. 3. Brown turkey and thighs for 15-20 minutes or until skin is golden. Reduce temperature to 350 F and cook turkey until it reaches an internal temperature of 150 C (using a meat thermometer), about 1-1.5 hours. Remove from oven and cover with foil and a dish towel let rest for half an hour before carving. The internal temperature of the turkey will keep rising while it rests. 4. Carve and serve with PC® Cranberry with Port Wine Holiday Sauce, and home-made gravy. We have partnered up with PC to give away a $75 President’s Choice gift card so you can try Chef Dino Renaerts turkey recipe. I love the sweet potato and apricot dish made by my mom. My favourite holiday dish is stuffing! A nice Beer infused turkey is the best! Love turkey with cranberry jelly and dressing on the side! I love the classic turkey dinner with stuffing, gravy and mashed potatoes! My favorite holiday dish is cheesy scalloped potatoes! I like Hot Turkey with gravy. My fave Holiday Dish is roasted turkey! turkey with stuffing,peas puddin,and all the delcious veggies,,oh and cranberry sauce,,yummm! scalloped potatoes are my fave! My favourite dish is the Cabbage Rolls. In my family Christmas means trifle for dessert. Custard, alcohol, and sponge? What’s not to love?! My favourite holiday dish is ham with mashed potatoes. I like the Philippine desserts such as Leche Flan, Brazo de Mercedes and Sans Rival. My mums cranberry sauce and dressing! Self basting turkey, stuffed with gramma’s old fashion stuffing recipe! Brussel sprouts with onion and bacon bits! Fav holiday dish is scalloped potatoes! SOOOOOO yummy! I like having stuffed turkey.